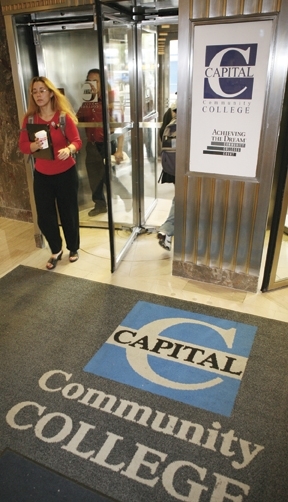 Capital Community College will welcome more than 40 employers on Thursday, April 4th, at its first annual Career Fair and Conference from 10 a.m. to 3 p.m. at Centinel Hill auditorium at the 950 Main Street campus. The event is free and open to the public. Students, alumni and community partners are encouraged to participate. Capital Community College’s Career Fair and Conference on Personal Finance on April 4th is free and open to the public. In addition to employment opportunities, the fair will feature workshops on personal finance, financial coaching and investing led by financial planners and counselors. The career conference, organized by the FIRST Center of the College’s School of Work Force and Continuing Education, will also offer resume review and assistance and information on how to use the College Central Network to connect with jobs. The FIRST Center is a personal finance and counseling resource on campus providing coaching, tax preparation and workshops on budgeting. The roster of employers participating in the Career Fair includes major insurance companies and banks, hospitals and health care providers, construction companies and utilities, information technology firms and social service and early education providers. This entry was posted in Adult Learning, Announcements, Career Advancement, Financial Literacy, Workforce Development and tagged #DestinationCapital, capital community college, Employment, Financial Literacy. Bookmark the permalink.